Galactic society is ruled by algorithms. From interstellar travel and planetary terraforming to artificial intelligence and agriculture, every human endeavor has become completely dependent upon the hypercomplex equations that optimize the activities making life possible across hundreds of inhabited worlds. Throughout the galaxy, Man has become dependent upon the reliable operation of ten million different automated systems. And when things begin to go wrong and mysterious accidents begin to happen no one has any idea what is happening, except for a sentient medical drone and the First Technocrat of Continox. But their ability to even begin to try fixing the unthinkably complicated problem of galaxy-wide algorithmic decay is made considerably more difficult by the fact the former is an outlaw and the latter is facing a death sentence. Johan Kalsi is Finland’s hottest science fiction author. An accomplished geneticist as well as a 6’3″ ex-Finnish Marine, in THE CORRODING EMPIRE, Kalsi shows himself to be more Asimovian than Asimov himself. This was a very surprising and compelling read. Clearly modeled on Asimov’s Foundation, this book does a much better and more interesting job of making that world seem real and possible. 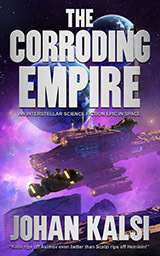 Part thriller, some hard-ish sci-fi, and part dystopian novel, The Corroding Empire was strikes a very resonant tone…. Growing up on Asimov and having a special place in my heart for Foundation, I found this to be a fantastic book and homage, of sorts, to Asimov. It’s well worth the time and a first-rate addition to the genre. The Amazon blurb brags that, “Kalsi shows himself to be more Asimovian than Asimov himself.” I wouldn’t go quite that far. The Corroding Empire fails as an Asimov pastiche in a few ways. The characters aren’t wooden cutouts, they are real, sympathetic, and relatable. The underlying theme of this book isn’t that everything would be so much better if only the technocrats were in charge instead of those lousy politicians – technocrats like the author, you know? This book doesn’t possess a strong undercurrent of contempt for the common man and all his problems, it sympathizes with the little guys who suffer whenever the managerial class screw up their five-year plans, as they so often do…. And in that way, this isn’t Asimov. It’s something far better. A truly thought-provoking book of where man’s hubris may take us. A new type of apocalypse book. Mr. Kalsi takes us through a detailed tale of how the arrogance of man, the religion of science, the infallibility of man and how the system can control and predict everything leads to disaster. I thought it was going to be largely tongue-in-cheek humor. Instead it’s a pretty strong straight sci-fi story, told as a series of vignettes over an expansive period of time. The comparisons to Asimov’s Foundation are apt but I would say it nods in Asimov’s direction rather than ripping him off. Surprisingly brilliant. A taut, imaginative, superbly crafted tale in the finest traditions of Isaac Asimov. As a re-telling of Foundation, as out-Asimoving Asimov, it deserves five stars. Heck, for having a MUCH better protagonist in Servo than Asimov had in Hari Seldon, I’d assign seven stars if I could.